Relax….rejuvenate….sunbathe….practice yoga & deepen your practice….admire stunning views….eat well….. enjoy peace & tranquility….have fun!! 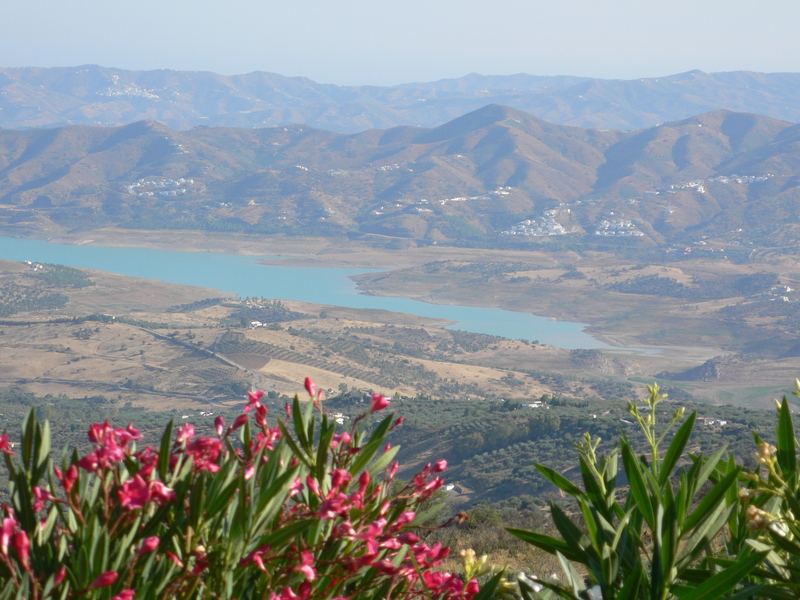 Come and enjoy a six day yoga retreat at a beautiful venue near Periana, in the Andalusian mountains, Southern Spain. Leave work and home behind! …. be healthy…enjoy vegetarian/vegan/organic food, good company, lots of sunshine, and relax and rejuvenate as well as invigorate yourself – enjoying the benefits of a beautiful venue with swimming pool and lots more! This holiday is reasonably priced, very relaxing, comfortable and personal; and reflects the care that has been taken to make you feel at home. Situated in the mountains east of Malaga, surrounded on three sides by spectacular mountains, with fantastic views – great for relaxing, sunbathing, walking and cycling! In addition, mountain bikes are available free of charge, for exploring the quiet roads and surrounding countryside, or visiting the nearest Spanish village, or exploring the fields of olive and almond trees. More importantly(!) perhaps for some of you….relax, enjoy a good book, sunbathe or swim………or enjoy a fresh homemade juice by the pool in sun or shade, admiring the wonderful views across the Andalusian hills and villages. In the distance, you can catch a glimpse of the glittering sea, and on a clear day you can see Africa. There is some life nearby – a local Spanish restaurant and bar offering coffee, drinks and meals, and 1.5 miles there is a small village with several cafes and shops. Trips to the beach, the nearest Spanish town with shops, restaurants and cafes, or perhaps a round of golf at a brand new golf course, can all be organised by Jane. 3 meals a day – all home-made, healthy vegetarian, but filling and energising, with lots of fresh ingredients! – except one evening meal when we will go out locally. Evening activities – films, discussion, games, sunset walk. Yoga classes will start on the Sunday evening and run through until Friday evening, (as you will leave Saturday). The Sunday evening class will be a gentle warm up and introductory session. The classes are for beginner / intermediate / advanced level, with variations so you can go at your own pace. All classes are optional – if you wish, just come to the retreat centre to relax, swim, walk and perhaps enjoy a massage or some reiki or hypnotherapy! All the daily yoga sessions are tailored to the individual’s skill level and goals. Instruction can be adapted to fulfil a range of goals, such as addressing physical limitations, developing a regular home practice or deepening and intensifying one’s existing practice. Practice morning yoga on a purpose built shaded tiled area five mins walk up the mountain, with views of the Andalusian hills all around; smell the sweet scent of the olive trees and listen to the bells of the mountain goats in the distance. Enjoy deepening your yoga practice by being surrounded by nature and tranquility; and giving yourself the opportunity to re-connect with your inner self as you take time out! Enjoy watching the sunset whilst meditating or taking a gentle stroll after dinner. The afternoon class will be slightly gentler, perhaps some yin yoga to help deepend flexibility, yoga therapy, slow vinyasa flow, deepening alignment, meditation techniques, yoga nidra (very deep relaxation), partnership yoga, breathing techniques (pranayama) and chakra balancing to restore and balance the body’s natural energies and to release deep seated physical, mental and emotional tension. Fly to Malaga airport. There are a number of airlines serving this destination, including many internet companies such as Easyjet, Aer Lingus and British Airways. It is also possible to fly to Granada airport. The retreat is about 50km from Malaga, and the taxi will take about 1 hour. We will share transfers. Dates for retreat to be announced. If you are interested in attending the retreat, more information will be provided later. There will also be an opportunity for you to hear more about other alternative therapies offered, such as massage, reiki and hypnotherapy! If you have any more questions, please don’t hesitate to ask! I look forward to hearing from you! Deposits are deducted from the full amount, leaving a balance payable. Failure to do so may result in your place on the retreat being re-allocated. If the balance is not received by the due date, the holiday will be treated as a cancellation and any monies already paid will be forfeit.